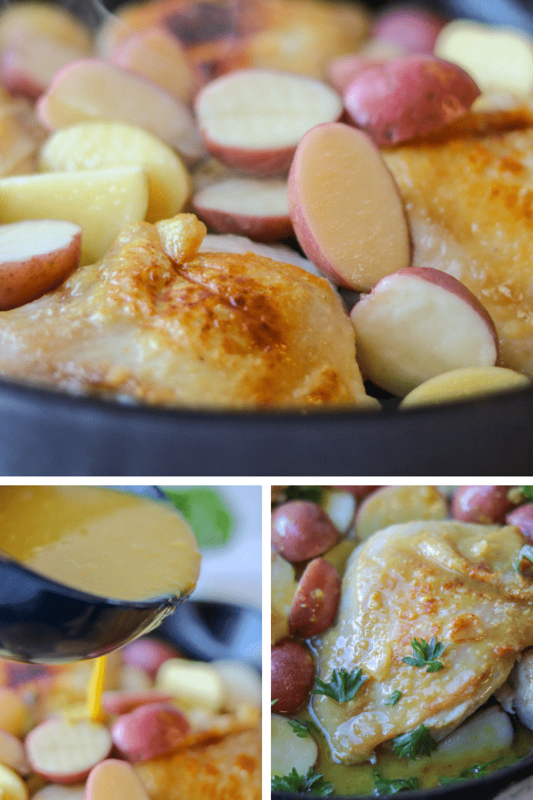 This Creamy Honey Mustard Chicken recipe is packed with delicious flavors from garlic, of course honey and mustard. Perfectly seared then baked to perfection. Another simple dish that’s easily prepared for any occasion! So, I have a confession: Growing up I was not a fan of honey mustard. I know, you must be thinking “how can you not enjoy the flavors of honey mustard”, right? WELL, I was a picky eater and honey mustard fell into that category. Nowadays, I appreciate the versatility of chicken – from baking to BBQ chicken, and even now honey mustard chicken. This chicken is first seared then baked in the oven for 30 minutes. The sauce requires little to no technique. Simply combine the honey, mustard, and a few ingredients, add the sauce to the chicken, bake for 30 minutes, then dinner is served! 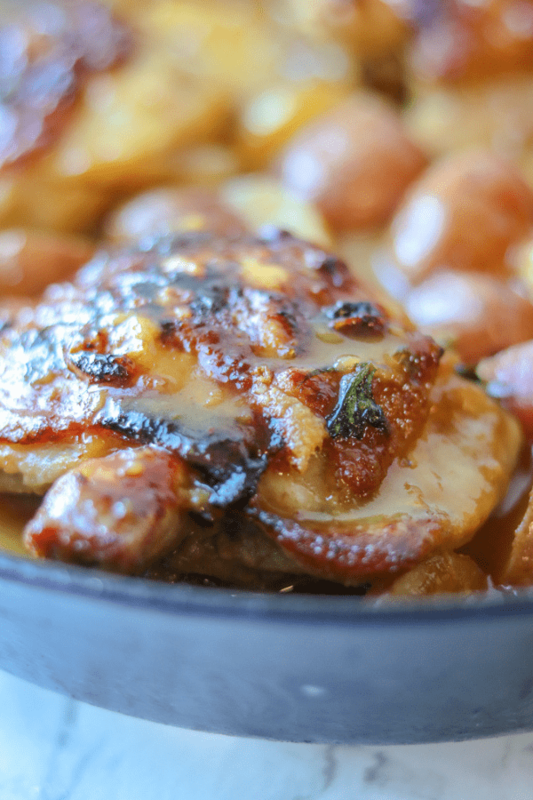 Why this creamy honey mustard chicken recipe work? This recipe is a busy person’s best friend in a pan. It is quick. Delicious. Requires a few ingredients. And will be enjoyed by everyone in the family. Simply serve the honey mustard chicken with salad or vegetables; this dish even works well with rice. After the chicken is cooked, it is juicy, tender, and the flavors will burst in your mouth from the first bite. I also like to add potatoes or vegetables when cooking the chicken. What’s needed to make the honey mustard chicken recipe? Not much! Seriously speaking you can literally make this chicken with just the chicken parts, mustards, and honey. 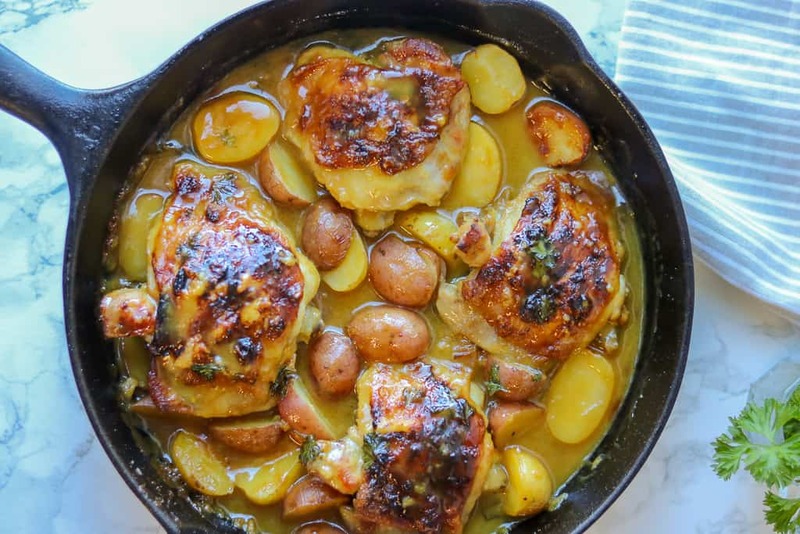 However, to enhance the flavor you’ll actually need 4 chicken thighs, salt, and pepper to taste, 2 cloves garlic, olive oil, honey, Dijon mustard, yellow mustard, water, parsley, and potatoes (optional). That’s it! As simple as that. These 10 ingredients will wow anyone at the dinner table once they are all incorporated. 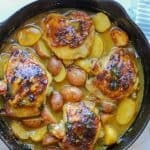 What kind of chicken should I use to make the honey mustard chicken recipe? To be honest, you may use any chicken parts you like. However, in my opinion, it is best to use either chicken breast or chicken thighs as both are juicy and are easy to work with. For this honey mustard chicken recipe, I use chicken thighs because I wanted a complete sear (crispy skin) prior to baking the chicken. As a result, the chicken has added texture. How do you make creamy honey mustard chicken? It’s super easy, my friends! In a medium bowl combine the water, garlic, mustards, and honey. Set aside. Cut potatoes in halves. Set aside. I also like to sit them in water while I prepare the chicken. Wash and pat dry the chicken. I like to wash my chicken with distilled vinegar first then wash it again with water for two reasons: it helps kill any bacteria (a common belief from growing up in Haiti), and also because it’s a great way to make the chicken nice and tender. Afterward, lightly season the chicken with salt and pepper. Now to the fun part, in a hot oil skillet, sear the chicken on both sides (about 3 minutes per side) until golden brown. Reduce the heat and add the mustard mixture, season with salt and pepper. Coat the chicken. Then add the potatoes and parsley. Coat well. Bake for 30 minutes until completely cooked and serve warm. Savory Thoughts: Everything you’ve ever wanted is on the other side of fear. – George Addair. 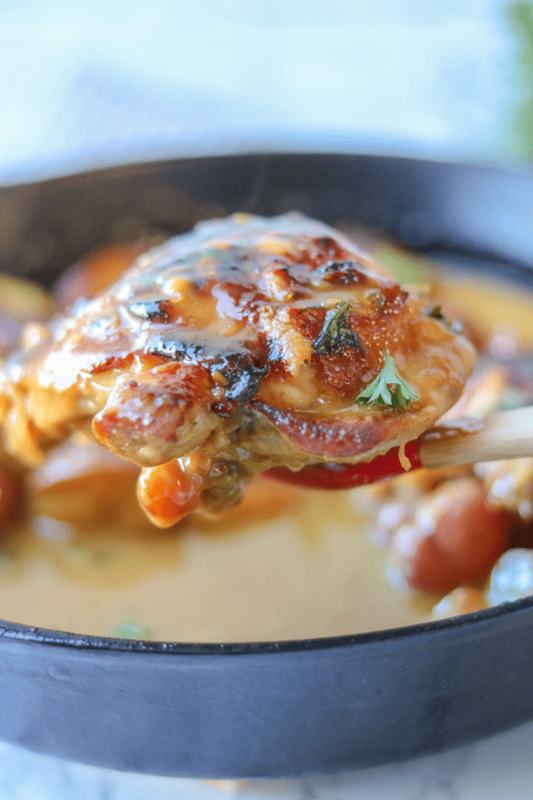 Did you make this creamy honey mustard chicken recipe? Tag your Instagram photos with #savorythoughts and mention @savorythoughts so I can see and share your delicious meal! I’d also appreciate it if you could rate the recipe below! This Creamy Honey Mustard Chicken Recipe is packed with delicious flavors from the honey, garlic, and mustard. Perfectly seared then baked to perfection. Cut potatoes in halves. Set aside. Wash and pat dry the chicken. Lightly season with salt and pepper. In a hot oil skillet, sear the chicken on both sides (about 3 minutes per side) until golden brown. Reduce the heat and add the mustard mixture, season with salt and pepper. Coat the chicken. Then add the potatoes and parsley. Coat well. Bake for 30 minutes until completely cooked and serve warm. You can substitute the 8 oz sunrise medley one bite potatoes (about 14 potatoes) for small red potatoes. HOLY MOLY!!!! I am definitely putting this on the Sunday dinner list! This looks so easy and perfect for weeknight dinner! I’ll bet that sauce is packed with flavor. 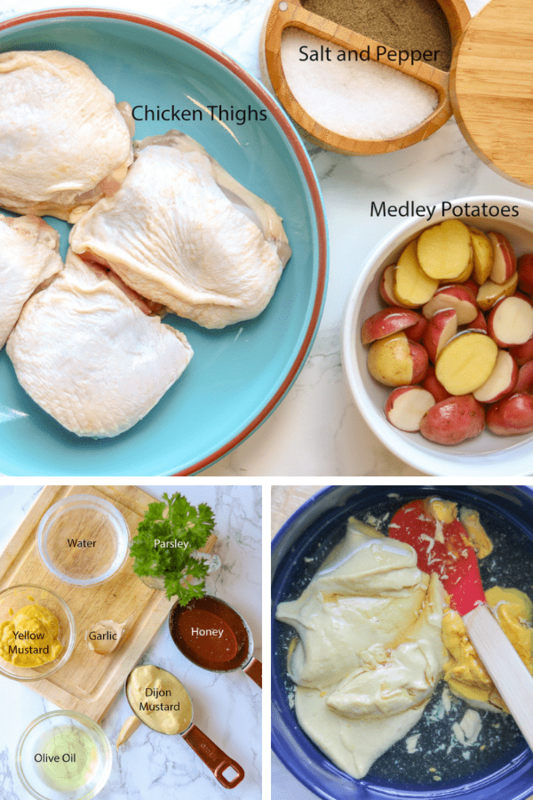 LOVE a one pan meal for the weekdays – my girls will love this after school! The potatoes look dreamy! MMMM, I am totally making this for dinner this week, it looks fantastic. I love honey mustard! This looks like it is so full of flavour and easy to make which is great! 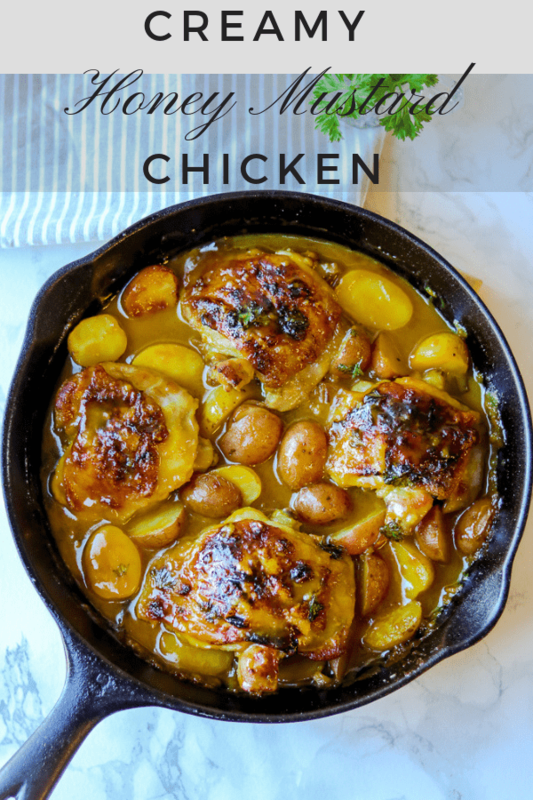 I love this savory dish and the chicken looks so moist and delicious! This looks so dang flavorful and delicious! Love that crispy looking skin, yum. Oh my, that looks so tasty! I’m drooling. A gorgeous recipe! Honey mustard is one of my favorite combos! This looks like the perfect comfort food skillet dinner, and I love how easy it is too! It is a comforting dish. I too love the simplicity of this dish. Thanks for reading, Kari. Yummy, such a treat. Chicken is so comforting like this! The golden brown crust on this chicken is gorgeous! This is such a delicious meal, the flavors are so good. I love how easy it is to make too. Thank you very much, Emily. It is very easy to make. This meal looks delicious! The chicken looks crispy yet moist. I’d love to try this soon. . yum! It is very delicious. Thank you, Astrid! Honey mustard is a one of my favorite flavor combos, this is do tempting!! You had me at honey mustard! Love this recipe. Must make it soon.